W pracy przedstawiono charakterystykę podstawowych rodzajów modeli spawalniczych źródeł ciepła wykorzystywanych w analizie pola temperatury. Pierwsza część pracy obejmuje genezę modeli źródeł ciepła przy spawaniu oraz opis takich modeli jak model płaski dyskowy, oraz model podwójnie elipsoidalny Goldaka. 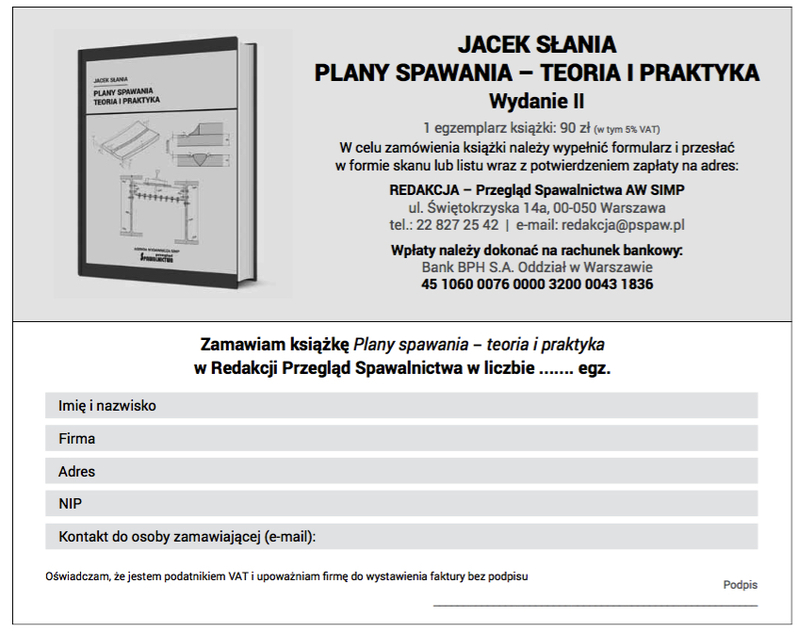 W dalszej części pracy przedstawiono przykłady zbudowanych modeli numerycznych spawanych płyt, w których zaimplementowano cztery różne modele źródeł ciepła: dyskowy, podwójnie elipsoidalny, prostopadłościenny i hybrydowy. Zobrazowano wyniki obliczeń numerycznych (MES) w postaci rozkładów pola temperatury w analizowanych modelach oraz dokonano porównania otrzymanych wyników. The paper presents the characterization of basic types of welding power heat sources used in the analysis of temperature field. The first part of the paper contains the genesis of heat source models used for welding processes. It describes mainly the flat disk and double-ellipsoid Goldak models. The second part of the paper presents as an example numerical (FEM) models of welding heat sources. Four types of disk, double-elispsoid, cuboid and hybrid models were constructed. The results of temperature field obtained from these models were presented and analyzed in comparison to each other. The results of temperature distribution show that it is very important to select adequate type of heat source model for the simulation of a welding process. Komanduri R., Hou, Z.B. : Thermal Analysis of the Arc Welding Process: Part I. General Solutions, Metallurgical and Materials Transactions B, Vol. 31B, pp. 1353–1370, 2000. Golański D., Chmielewski T.: Modelowanie pola temperatury w czasie stygnięcia układu powłoka-podłoże wytworzonego przez natryskiwanie cieplne, Prace Naukowe Politechniki Warszawskiej. Mechanika, Zeszyt Nr 230, s. 95–104, 2010. Golanski D.: Temperature distribution in a cylindrical Al2O3-steel joint during the vacuum brazing cycle, Journal of Materials Processing Tech- nology, vol.56 (1-4), pp. 945–954, 1996. Hudycz M., Chmielewski T., Golański D.: Analysis of Distribution of Temperature and Stresses During the Friction Metallisation of AlN Ceramics with Titanium, Biuletyn Instytutu Spawalnictwa w Gliwicach, vol. 60, No. 5 pp. 63–67, 2016. Choa JR, Leea B.Y., Moonb Y.H., Van Tynec C.J. : Investigation of residual stress and post weld heat treatment of multi-pass welds by finite element method and experiments, Journal of Materials Processing Technology, Vol. 155–156, pp. 1690–1695, 2004. Yi H-J, Kim J-Y, Yoon Y-H, Kang S-S: Investigations on welding residual stress and distortion in a cylinder assembly by means of a 3D finite element method and experiments, Journal of Mechanical Science and Technology, Vol. 25, Issue 12, pp. 3185–3193, 2011. Rosenthal D.: The Theory of Moving Sources of Heat and Its Application to Metal Treatments, Trans. ASME, 68-11, pp. 849–866, 1946. Pavelic V., Tanbakuchi R., Uyehara O.A., Myers P.S. : Welding Res. Suppl. July, pp. 295–304, 1969. Komanduri R., Hou, Z.B. : Thermal Analysis of the Arc Welding Process: Part II. Effect of Variation of Thermophysical Properties with Temperature, Metallurgical and Materials Transactions B, Vol. 32B, pp. 483–499, 2001. Eagar T.W., Tsai N.-S.: Temperature Fields Produced by Traveling Distributed Heat Sources, Welding Journal, Vol. 62(12) pp. 346–355, 1983. Krutz G.W. and Segerlind L.J. : Finite element analysis of welded structures, Welding Journal, Vol. 57, pp. 211– 216, 1978. Goldak J., Chakravarti A, Bibby M.: A new finite element model for welding heat sources, Metallurgical Transactions B, vol. 15, no. 2, pp. 299–305, 1984. Francis J.D. : Welding simulation of aluminum alloy joints by finite element analysis, Master’s Thesis, Virginia Polytechnic Institute and State University, USA, 2002. Goldsmith A., Waterman T.E., Hirchorn H.J. : Handbook of thermophysical properties of solid materials, New York 1961.